Missouri Education Watchdog: Common Core Aligned Curricula Discussed by a Teacher/Parent. Heart Mapping, Data Mining and More. Common Core Aligned Curricula Discussed by a Teacher/Parent. Heart Mapping, Data Mining and More. Is this the type of education that will make students globally competitive? Do you want your child's "heart mapping" entered into a data base or published on the Internet? * Common Core “State” Standards (CCSS) as I have researched them online and witnessed firsthand in Math with my 3rd and 5th grader, as well as in English/Lit. (ELA) with my 7th grader in Southeast Wisconsin. * CCSS are evaluated through Formative and Summative Assessments. Formerly known as Quizzes and Tests to you and me. * Grades are no longer relevant with this system. I was told by the principal at the Middle School and my 7th grader’s English teacher, that the goal is to give a child a firm comprehensive conceptual understanding of the standard being evaluated rather than stressing over getting an A on a test. * So how do they assess this conceptual understanding? The CCSS uses a 4 point system. This is not your college GPA. These numbers are not averaged over time, nor do they translate directly to the traditional ABCDF we are familiar with. Even though at this time, colleges and future employers still demand this old style of grades. They are still working out how these “data points” showing growth and improvement over the quarter translate into these old fashioned grades. * Currently this is how they explain the number system used for Student Assessment. 1 = Fails to meet the goals set forth for this standard. 2 = Minimally meets the goals set forth for this standard. 3 = Proficiently demonstrates the goals set forth for this standard. 4 = Masters the goals set forth for this standard. * If at the end of the quarter your child has all 3’s and 4’s = A, all 3’s and 2’s = B, all 2’s = C, all 2’s and 1’s = D, all 1’s = F. This is subjective based on their steady improvement and continual work to grasp the standards being covered and can be modified by the teacher to reflect their hard work. This is only being implemented to my knowledge in the 7th grade middle school English department at this time in our school system. * In order to minimize the initial confusion of implementing the Common Core, the elementary school chose to keep the traditional ABCDF for now and only focus on the new method of teaching. * So how do these numbers apply to a simple math problem? The best example I have is from my 3rd grader during the first quarter in addition this year. + 32 and you did nothing else you would get a 2! You see “we don’t truly understand what we are doing with this problem, in so much as we are just performing rote memorization to answer this one,” per our Director of Curriculum. * Here is what my child had to do with this problem next to get a 3! * Now to get a 4 you have to then write a sentence something like this to show you truly comprehend what it is that you are doing when you add two numbers together to get an answer. block so I added them to the tens blocks to get the answer of 32. * Congratulations you have just taken 10 minutes to answer what my child knew in five seconds was the answer to this problem to start with. But, now he truly understands what he is doing when he adds two numbers. * The teachers gave them the summative assessment for this unit. Answer 100 addition problems in the old fashioned way in 5 minutes. Of course the students all passed, as they had memorized basic addition and subtraction facts for these type of tests last year. * I decided to let them sink or swim with this one. On to multiplication they went. * My child truly understands what he is doing when he multiplies two numbers together. One of the teachers told me they knew that the students all got the concept now and that in two chapters they were going to be starting division. Therefore, they decided to give the summative assessment for multiplication. * You guessed it….100 problems in 5 minutes. They all failed! My child who is a whiz, or was, at math came home with a 33. Now mind you, every problem that he answered he answered correctly. He simply could never complete this task in 5 minutes the way he had been taught if his life depended on it. It takes him 15 - 30 seconds for the simplest of problems. To compete this timed test (assessment) you have 3 seconds to come up with and write down each of the answers. * The CCSS standard for this grade level is to be able to “multiply all one-digit numbers from memory (knowing their time tables)” and to be able to “multiply one-digit numbers by multiples of 10 (such a 20, 30, 40)”. They will be able to do this. However, without the rote memorization of these simple fact tables they will not have the speed necessary to complete the more complex math tasks later on. I do not see how this speed with magically come to them without the use of rote memorization. This is something our school has chosen not to practice (i.e. flashcards with the third grade). Although this is not a stated prohibited activity as such in the Common Core, some teachers have interpreted them to mean just that. Many of the curriculum’s offered that are certified CCSS compliant are straying away from rote memorization of anything as the student is not truly understanding what they are doing, just spitting back the facts. * The Letter Home…Need Flash Cards? I received a letter from the third grade teachers asking me if I had flash cards to help them increase their speed with multiplication facts. This was due to the fact that all the students had done so poorly on the assessment. They would gladly provide them to me if I didn’t have any. Here we go again. It is up to us to teach them the basics where the curriculum has failed them. * The answer is obvious to me (and it appears that some other states agree (Governor Pence of Indiana is leaning toward this idea). CCSS seem to be relevant in the beginning of a new subject/concept, in this case multiplication. However, once the students “get it” the school has complied with the letter of the law. They must now take it upon themselves to teach it in any way the kids will be able to apply it, in order to move onto the next concept or standard. In this way they are still upholding the spirit of the law. In this case, that is the teaching them by rote memorization of the “times tables” for speed and accuracy before moving onto division. * Further facts about the CCS I have uncovered. But apparently that’s not the case, according to Sunburst Visual Media, the puzzle’s producer, or the Union Grove school district. Varebrook said she doesn’t believe her daughter’s teacher is the problem, but rather the curriculum she’s forced to teach. “I don’t think her teacher is a radical indoctrinator, it’s the curriculum,” she said. “It’s not factual. Every piece of homework I’ve seen paints conservatism in a negative light. On the back side of the crossword puzzle was a political survey students were required to fill out to identify their beliefs, something Varebrook believes is equally troubling. “It’s about guns, it’s about freedoms, it just goes on and on,” Varebrook said. Varebrook said her daughter is 13 years old, and likely has little interest in political philosophy. “She didn’t pick up on (the bias), she was just happy to get it filled out,” Varebrook said. Varebrook plans to email her daughter’s teacher about political bias in the assignment, but is skeptical of what good it will do. “My guess is most students got this done in class and didn’t bring it home,” Varebrook said. “I put it on my Facebook and people were just shocked. My daughter's fifth grade reading class was studying the book, "Guns for General Washington". (Prezi presentation attached). On her Day 3 study group guide page there were vocabulary words and then questions regarding Chapter 9. It was the first of these three questions that caught my attention. Paul hated the British for making him feel weak and fearful. He also despised himself for giving in to those feelings. Describe a time when you had those feelings. My daughter came to me upset because she didn't know what to put down as she had never felt this way, but didn't want to lose points for not answering the question. I instructed her to put "I've never felt this way." And then, I attached a note stating that this question is not appropriate for school. You are forcing a child to create a traumatic experience in order to complete this assignment. This is best left to the psychologists. It is irrelevant to our history, social studies and her understanding of this book. The teacher replied, "Just want the students to make connections to the characters in the story." Really? A historical figure in a book about the revolutionary war….”Characters” and “Story” denote fiction to me. ● SELF REPORT pg 35­37 : measures students attitudes, goals, emotions and beliefs, “for example, in the Experience Sampling Method (ESM), participants typically carry around a handheld device that “beeps” them at random intervals, prompting self­-report of experiences in that moment (e.g., Hektner, Schmidt, & Csikszentmihalyi, 2007). Such data can be used to make inferences about emotions, thoughts, and behaviors within and across specific situations. Having seen this, I realize this question was much more inappropriate than I originally thought. We have to read every question, every line, to be sure we don't miss any more examples of DATA MINING like this. My oldest son took an example of DATA MINING through Self-Reporting last year in October while he was in 6th grade. This is only one of several examples that occurred last year. In this instance I went to parent/teacher conference where they required my son to go along. Instead of meeting with the teachers, my son was told to show me through a folder of work he had on his desk and to explain it all to me. The teachers were present in the room and roamed from table to table to talk to various parents and students for a few seconds. In the folder was this form that my son explained they had to fill out in class. It asked him to rate himself in areas of self-direction, communication, discipline, work habits, etc. but there were specific questions on the back that were much more detailed. For example: “So far this year, I think I am doing well in...because?” and “I need to work harder in/on?” and guessing how they think teachers would describe them as a student. My son's seventh grade CCSS ELA assessment for poetry took DATA MINING through Self-Reporting to a whole new level. This assessment was to create a poem based on the following questions in support of the statement "Where I'm From". (MEW note: there are numerous templates for this particular poem and exercise on the the Internet). 1. What special places to you go to spend time (e.g. fort, creek, etc.)? 2. What games and/or activities fill your time? 3. What are your family's traditions, holiday or otherwise? 4. What is your family dynamic (e.g. the make-up of your family, etc.)? 5. What is something you and/or your family take pride in? 6. What is a family TRAGEDY and/or TRIUMPH that strengthened and/or challenged your family? 7. What candy, treats, and/or toys do you buy and/or are OBSESSED with? 8. What is your favorite book or series? 10. What is a saying or expression that adults or other kids use? 11. How are your family memories ORGANIZED, SHOWCASED, KEPT, etc.? 12. When and/or how are these memories ACCESSED? 13. How do these memories SHAPE you? This assessment it should be noted was pulled from an internet site but the teacher said the example wasn't really how they wanted it to be done. It went into a form as shown below. Notice that if a child is very clever there are ways to evade the obvious attempt as extracting information, but it took a lot of effort. My son's particular teacher is not into computers or science, it should be noted. If we hope to succeed at defeating this CCSS then we have to teach our children to be just as evasive, devious and clever as they are at denying them the very information they are trying to glean. This is not the type of education I had hoped for my children, but nonetheless it is their future and they must learn to navigate through it. This example is how the seventh grade teachers dealt with the new CCSS ELA standards regarding the study of poetry. This had been a 6 – 9 week unit that was shrunk down to 9 DAYS! My son’s teacher was very upset with the shortened time frame (but my son and some of his friends who love to write but hate poetry, were gleeful) and his teacher had been out voted as to what poet they were going to study. I asked for her to state her position through me anonymously but she refused. This is common place as many are afraid of losing their jobs, teaching licenses, etc. Here is the unit and poet they were exposed to and my son and one of his classmates example at how to beat the system once again, as in the above example. Georgia Heard: Bringing Poetry Into Everyday Life! Welcome! We all have poetry inside us, and I believe that poetry is for everyone, but can we recognize it when we hear it, in our students, and in ourselves? Whether you are a teacher, poet or child our challenge is to find the poetry all around us every day! That's one of my goals when I teach poetry is to help every student find the poetry inside. My New Book on Heart Mapping! Awakening the Heart explores how to cultivate the poet in every elementary and middle school student - through well-drawn examples, detailed exercises, creative projects, and down-to-earth classroom teachings. Ever since my book Awakening the Heart was first published, and I wrote about my idea of heart mapping, teachers, parents and students from all over the world have created heart maps and shared them with me. I'm now publishing a book about heart mapping with many beautiful examples included! I would love to publish your students' heart maps. What people have been important to you? What are some experiences that you will never forget? What happy or sad memories do you have? Here is the assignment that the students received. They studied the poet for one day. Began to brainstorm about their “heart maps” on the second day, drew what they envisioned these heart maps to look like on the third day, then spent the remaining time working on writing, editing, and perfecting their “Heart Map Poems”. The last two days of the unit were spent sharing their poems in class. “Poets write from their hearts about what we deeply care about…I write my poems from memories of my families, of growing up next to a creek in Virginia, and of the people I meet in my travels. “It’s a poet’s job to know the interior of his or her heart.” One way of accessing those feelings is to map your heart. 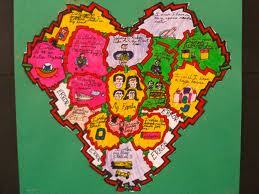 “We carry this heart map around all the time but how many of us know what it really looks like and what’s in it? Drawing a map of our heart helps make order out of what often feels like chaos and reveals the meanings behind the confusing emotions. And these meanings shine like gems that have been long buried. - What people have been important to you? - What are some experiences or central events that you will never forget? - What happy or sad memories do you have? - What small things or objects are important to you? Here is the final poem he turned in on the following page. He received all level 4’s on his rubric for this one. Another student wrote the following response to thumb their nose at the attempt to disclose personal information to the school. This student got all 4’s and one 3 for using a “Cliché” in the last line. I disagree with this assessment and think it is what makes this poem work so well. until a light ruptures the darkness. and the initiation of back-lit keys. We must teach our children while we fight to repeal this dreadful Common Core nonsense, just how to defeat the system for now so as to not volunteer any information that is not their business in the first place and has nothing to do with their education. I feel these two show promise in that regard. We will have more tales from the classroom about common core aligned curriculum within the next few days. "We must teach our children while we fight to repeal this dreadful Common Core nonsense, just how to defeat the system for now so as to not volunteer any information that is not their business in the first place and has nothing to do with their education." So, lie to the devil, or just not answer, or vaguely answer? All are justified to me in this case. Please respond to how to do this. My daughter is a Senior now. Can she still pull this off? I have always told her NOT to volunteer ANY personal information about herself or family.